If it wasn't for the rake, poker would have been a zero-sum game. Rake in online poker is by no means standardized: the poker rooms increase the rake in one spot and decrease it in another but increasing the cap; they lower the rake along with the rakeback, and so on and so forth, solely at their own discretion and the willpower of the market. Rake is the cornerstone of modern online poker: the poker rooms think it's never enough, the poker players think it's always too much. With hardening of the fields due to availability of educational content, with growth of competition due to a great number of people who want to earn money without leaving their home, the value of such parameter as 'winrate' increases significantly. And one of the most obvious options to save the winrate — if not particularly increase it — is to choose a poker site that collects the least amount of rake. The choice is not rather simple, plus there is a lot of other factors that define whether you should play in this or that poker room: no one is going to play with the rake of 1% and only 10 players online. Nevertheless, in order to save our clients' time, we are launching a series of articles with a detailed comparison of the rake in popular networks. Today we have chosen the largest networks that accept players from the USA: Chico, WPN, Revolution and EPN. The figures are true as of February, 2016. The WPN network ranks #1, Chico ranks #2, Revolution and EPN round out the top three. The table says it all: green cells mean the profitable values, gray cells are neutral, red ones — unprofitable. The cap starts playing an important role here: the percent of the rake straightens out in reference to the micro-stakes, and the cap may differ significantly. The leaderboard remains the same: WPN, Chico and Revolution/EPN. Our rating is as follows: Chico, WPN, Revolution, EPN. At these stakes, the structure of the rake might be more important for some players when they choose a poker room. The rake at Chico's mid-stakes is higher than in other networks, and the caps are humble. However, this is just the case when the rake is not the key parameter: Chico's mid-stakes field is the softest among all the large pro-American networks and the largest as well, so extra 0.56% make no difference in this particular case. 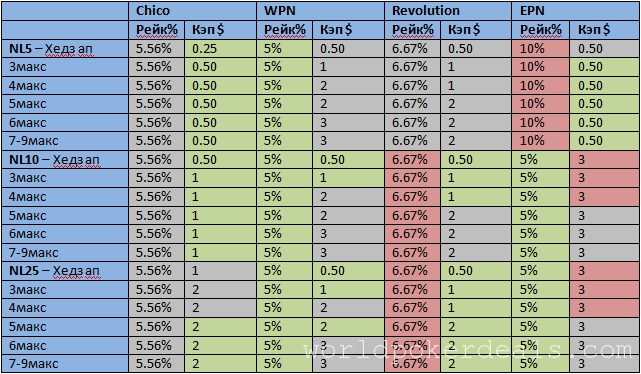 In terms of the high stakes rating, Chico and WPN share the first place, Revolution and EPN are on the second. At the high stakes the situation is even more curious. 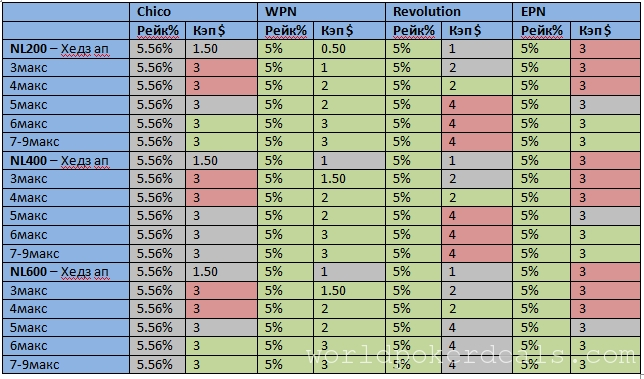 Not all the networks offer high stakes tables: Chico, for example, is limited by NL1K with a higher percent of the rake but lower cap; WPN offers tables up to NL5K with a decent percent of the rake but slightly higher cap at all tables except the full ones; Revolution and EPN have high stakes tables available, but there is almost no action there, and besides the rake cap is anyway inferior to their competitors. Tigergaming and BetOnline — great value of 50% @ the first deposit up to $2,500 + reload program + regular races + additional offer from WPD for real pros. Special conditions are available only through our manager in Skype. (Skype: rodion_longa). All the deals for this network are unavailable due to nonfulfillment of obligations by its poker rooms, breaches of agreement and big delays with cash-outs.